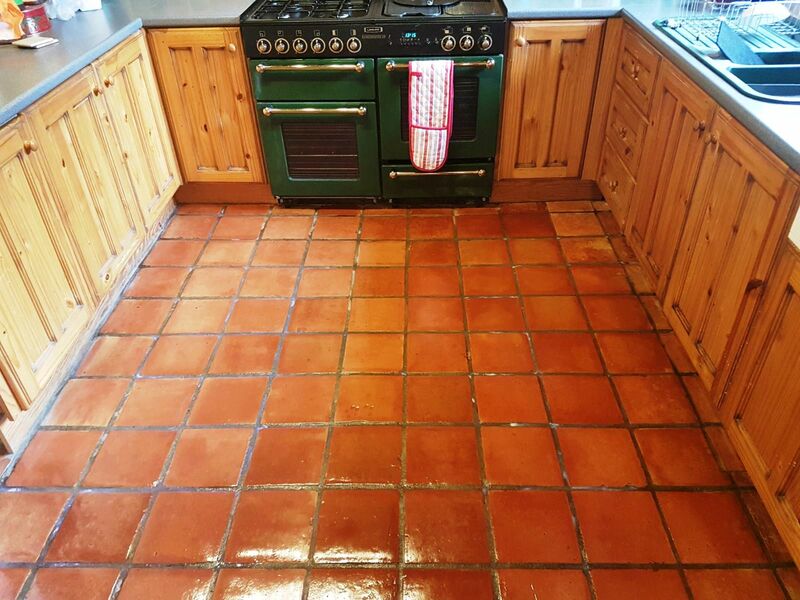 The Terracotta tiled kitchen floor in the kitchen house of this house in the residential district of Great Holm, just outside of Milton Keynes had been laid some time ago and was now well worn and dirty. The houses in the area are not that old and so I suspect the floor may have been down since the house was built. 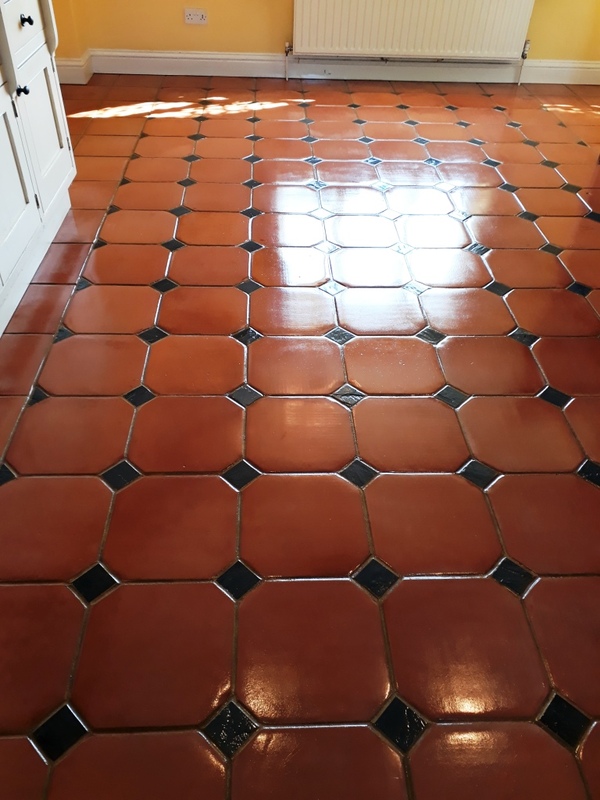 The Terracotta tiles had not been professionally cleaned for many years and the floor had lost its’ lustre where the sealant had worn away and dirt had become ingrained in the tile, the Grout had also darkened. 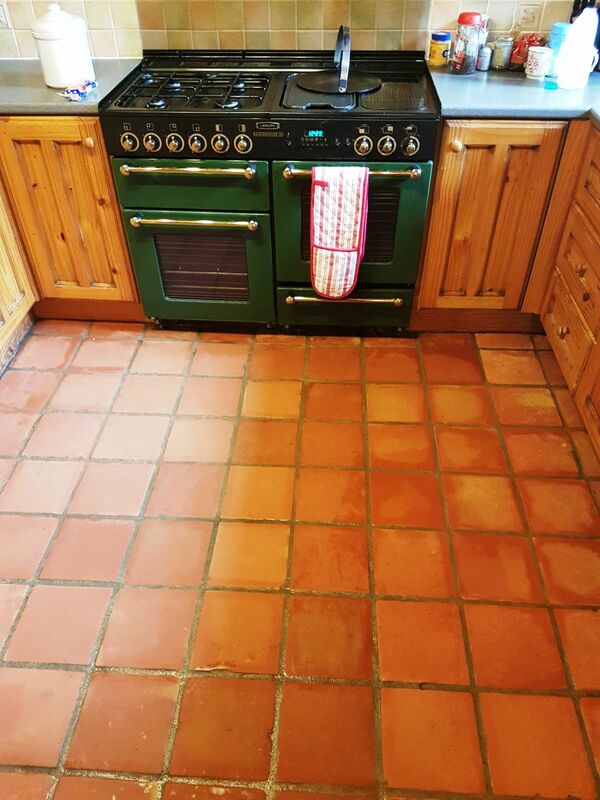 I went over to look at the floor and perform a test clean, so I could give the owner an accurate quote for renovating the floor. The quote was accepted, and we agreed a date to do the work which would take place over a four-day period. One day to clean the tiles, two days between for it to dry and one day to seal the floor in order to protect it going forward. 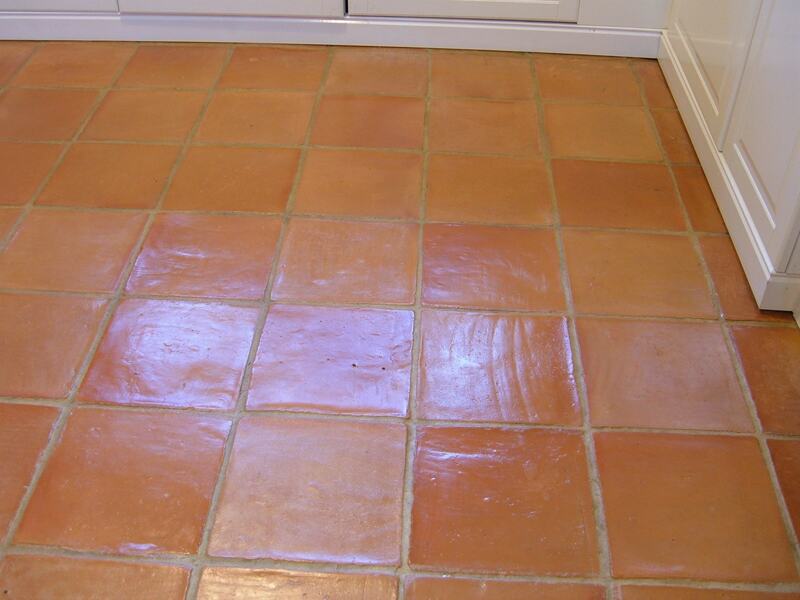 We started by applying a strong solution of Tile Doctor Pro-Clean to the floor. Pro Clean is a concentrated, multi-purpose high-alkaline cleaner, stripper and degreaser. 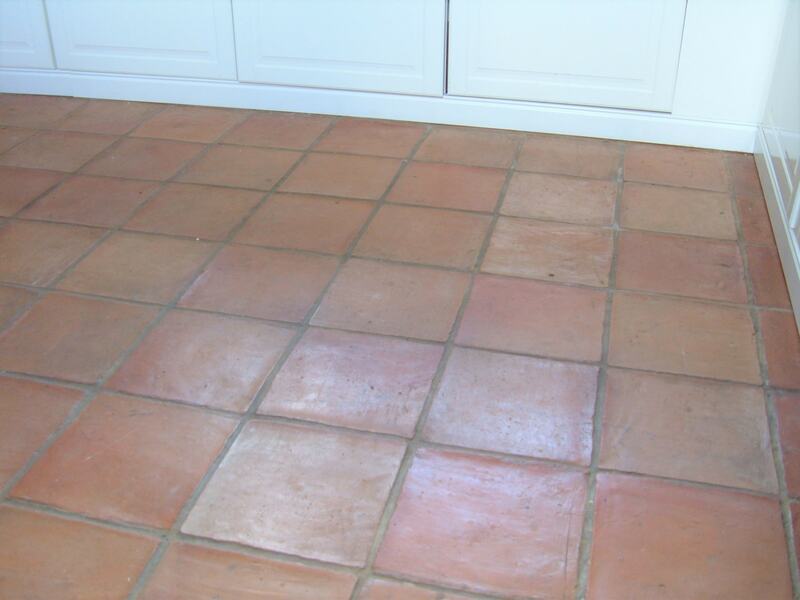 It is ideal for heavily soiled and neglected floors. 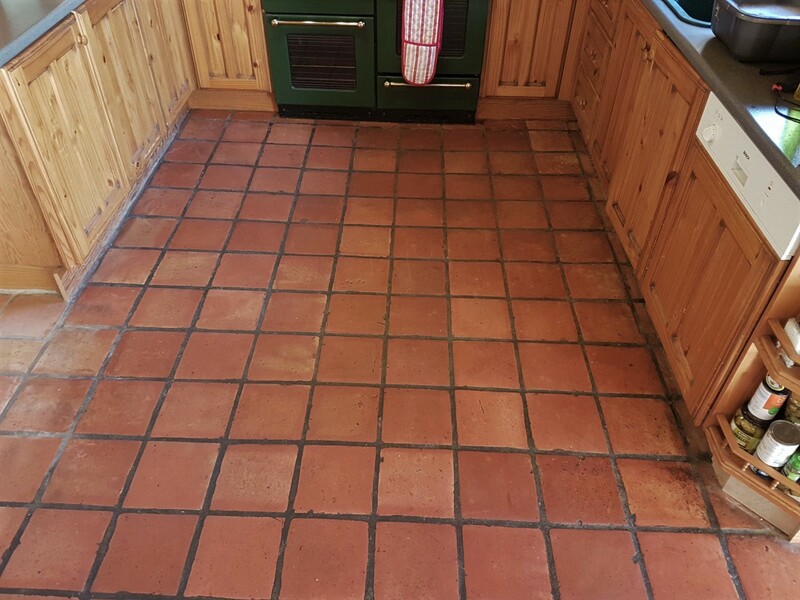 After about 10 minutes dwell time we used our scrubbing machine fitted with a black buffing pad to scrub the floor and loosen the ingrained dirt from the pores of the tile. A wet pick up vacuum was then used to remove the now dirty cleaning solution, we then thoroughly rinsed the floor by hand to remove any trace of cleaning product and so we could inspect the tiles to see if more work was required. In this instance I felt the floor could do with more work, so the process was repeated, and the edges scrubbed by hand. We let the floor dry a little over lunch but noted a few of the areas were not quite perfect. 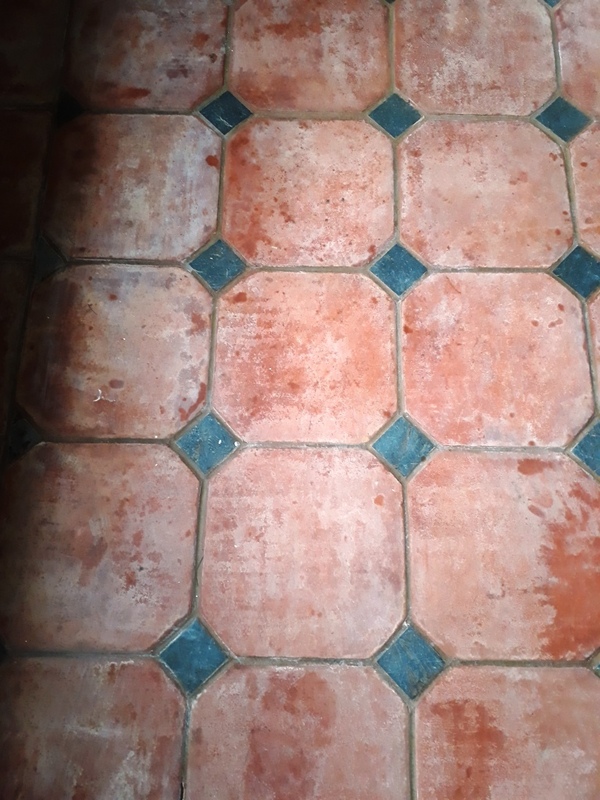 To get the best result on these areas we then used Tile Doctor Oxy-Gel, this is a stronger gel-based version of Tile Doctor Pro Clean which is perfect for spot cleaning specific stubborn areas. With the floor clean it was time to turn our attention to the grout and for this we used more Tile Doctor Pro-Clean and a specialized narrow grout brush to meticulously scrub each grout line. The floor was then completely rinsed with water. The floor was now spotless but before it could be sealed it would need to be dry, so we left specialised drying equipment in the room and allowed the floor two days to completely dry out. After two days we returned, we used a moisture meter to test that the floor was dry enough to seal. It was thoroughly dry, so we were able to carry on with applying the sealer which can be quite time consuming as you have to wait for the first coat to dry before applying the next. 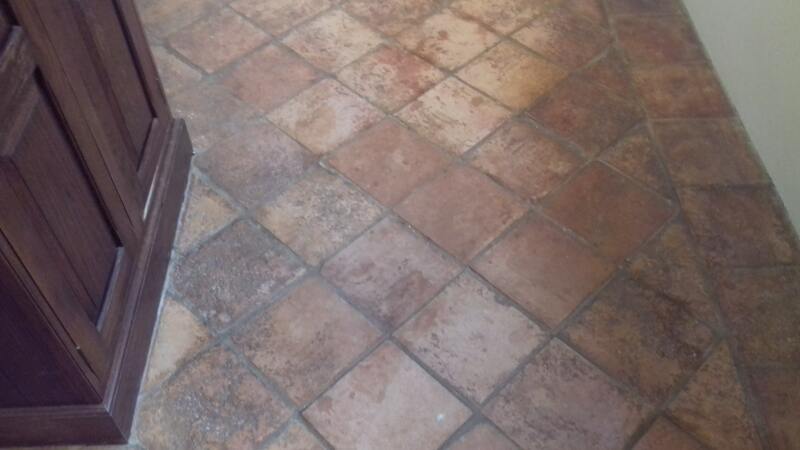 In this case the Terracotta proved to be very porous which is not unusual for a clay tile and it took eight coats of sealer before I was satisfied the tiles were fully sealed. 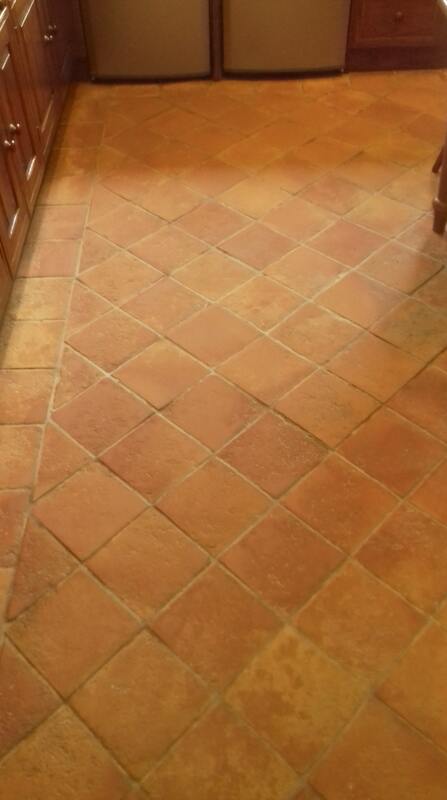 The sealer used to protect the floor was Tile Doctor Seal and Go which leaves a nice subtle satin finish on the tiles. Tile Doctor have a variety of sealers available and we select the sealant to suit dependent on the finish the client wishes to achieve. “Andrew explained the process clearly and the floor looks absolutely stunning. It is hard to believe the difference between before and after. I would have no hesitation in recommending Andrew.